To celebrate DC’s booming craft beer movement, Reston Limousine decided to give back to DC’s most devoted beer aficionados. The first five people who score 100% on this quiz two passes to one of our chauffeured brewery tours. 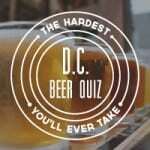 Extensive research went into the quiz to ensure that several of the questions are “unGoogleable,” so only true DC beer experts will score 100%. You think you have what it takes? Take the quiz to find out! The Quiz is Now Live!